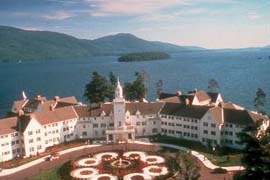 The Sagamore Hotel, located in the Lake George area of the Adirondack Mountains, was originally built in 1883 and perfectly restored. Lake George and Bolton Landing are within the borders of the six million acre New York Adirondack State Park. This historic hotel features clapboard siding and classic architecture. It also features ghosts! Ghosts have been spotted at the Sagamore dating back to the 1950s. So what kinds of ghosts walk the lavish halls of the Sagamore? One the ghosts began its ghostly appearances in the 50’s. He was a little boy, who was often seen chasing golf balls and selling them to the pro shop for extra cash. One day, he was hit by a car while running after a ball. The little boy began to haunt the Sagamore’s golf course and is still seen by guests out on the course. There have also been ghost sightings in the hotel’s fine dining restaurant, The Trillium (left). A ghostly couple, who was among the first guests of the hotel in the 1880s, is often spotted walking down the stairs and sitting in the reception area. As well, in the kitchen area, a tall woman dressed in white spoke to a prep cook in the other restaurant, Mr. Brown's. She then walked towards him - and through him - and disappeared. The spooked cook quit his job immediately.